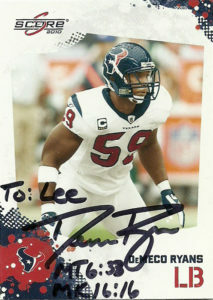 In 2011 Ryans started all 16 games at linebacker for the Texans. He’d post 44 tackles, 4 pass defensed, and 1 forced fumble. With the clock ticking on a new contract, the Texans opted to trade Ryans to the Eagles. DeMeco was a favorite in Houston, so when fans got word of what happened they were pretty unhappy. Ryans moved on to Philadelphia, where he was immediately shifted back to middle linebacker for 2012. DeMeco led the Eagles defense logging 86 tackles, a sack, an interception, and 4 passes defended. 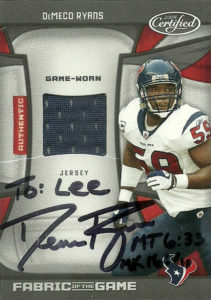 He’d have one more banner season in 2013 with 4 sacks, 102 tackles, 8 passes defended, and 2 interceptions for 46 yards. 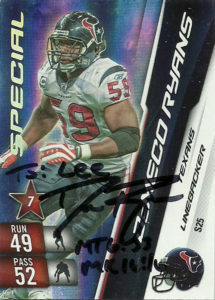 After an injury shortened 2014 limited Ryans to just 8 games, he played one final year in 2015 before he opted to retire. 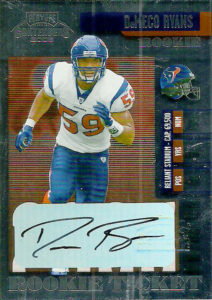 DeMeco has sued the Houston Texans and the stadium for poor surface playing conditions stemming from his knee injury in 2010. As of 2018 DeMeco is a linebackers coach for the San Fransisco 49ers. My buddy Lance had a surprising success getting DeMeco courtesy of the 49ers, so I decided to go ahead and shoot some cards out and take a shot. I really liked how the Score and Adrenalyn cards looked, so those were no brainers. (I was just surprised at how well the Adrenalyn turned out.) Equally surprising was how few patch cards I could find for the venerable Ryans, so I went ahead and picked up this somewhat uninspiring Leaf card, that just feels overly designed. He inscribed the cards with not one but two bible verses.